Receive updates on special events, new menu items, menu reviews, and more! Steak fries topped with chilli beans, cheddar cheese with a side of sour cream and jalapeno. Melted cheese dip with chorizo. Served with crispy tortilla chips. Crispy tortilla chips topped with a melted cheese blend, sour cream, chunky guacamole, pico de gallo and jalapenos. chicken wings in buffalo sauce. Share this menu with your friends ahead of time to get their mouths watering. flour tortilla wrap with lettuce, tomato, cheese bacon, ranch. your choice of grilled or fried chicken. Tastefully crafted gourmet style burger. Served with guacamole spread, crispy onion rings, lettuce & tomato. chicken sandwich grilled to perfection. served with mayo, swiss cheese, tomato and onions. Chicken salad in a flour shell. Served with rice, beans, lettuce, onions, sour cream and pico de gallo. Served on a toasted sourdough bread with mayonnaise, turkey, ham, bacon, swiss cheese and gouda. Green, red, a la diabla or mole. Served with onions and cilantro and your choice of red or green salsa. Choose from Asada, Chicken or Al Pastor. 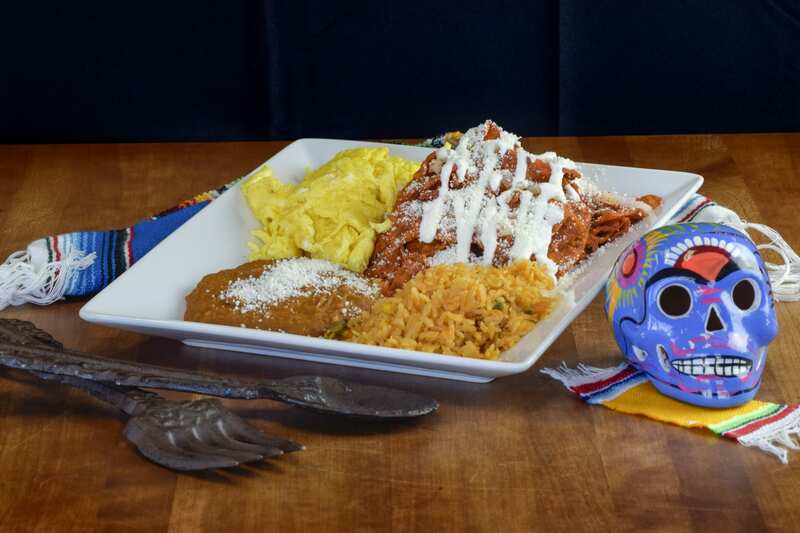 Giant flour tortilla, beans, rice, jack cheese and chicken, topped with our signature mole sauce. Chicken or al pastor burrito with refried beans, rice, cheese, onions and cilantro. Burrito stuffed with our chile relleno, rice, beans, cilantro and onions. Steak served on a bed of nopales, fresh rajas and refried beans. 3 enchiladas with your choice of red or green salsa. served with rice and beans. 3 soft tortilla tacos of your choice of Chicken, Asada or Pastor. Served with Rice and beans. Hand breaded pasilla peppers, stuffed with jack cheese. Tender chicken breast mixed in a thick, rich mole-sauce. Served with gourmet rice and beans. Grilled chicken breast slices. Served with rice and beans. your choice of grilled chicken breast slices, beef, shrimp or mixed. 2 pork chuletas. Served with Rice and beans. steak, chicken and chorizo with cheese, nopales & salsa. served with beans & rice and handmade corn tortillas. Topped with avocado and served with crackers and Tapatio. A fresh, delicious made from scratch garlic sauce. Made from scratch spicy salsa, complemented with gourmet rice and beans.